Certain matters do not get the attention they deserve because everybody is so focused on the election. Last week, a group of 38 NGO activists sent off a petition to President Maithripala Sirisena demanding that Sir Desmond de Silva QC, be removed from the panel of international lawyers advising the government of Sri Lanka on the Geneva issue. What they did was to get one NGO to lodge a complaint against Sir Desmond with the British Bar Standards Board and then send a petition to the president demanding his removal on the grounds that he is being investigated by the British Bar Standards Board! 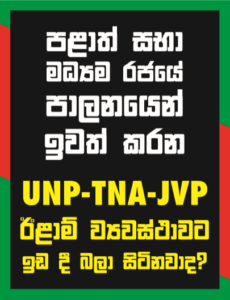 These are the same NGOs that presided over the removal of former Chief Justice Mohan Peiris through a combination of mob action and yahapalana executive fiat. They are now trying the same tactics to get Desmond de Silva removed.